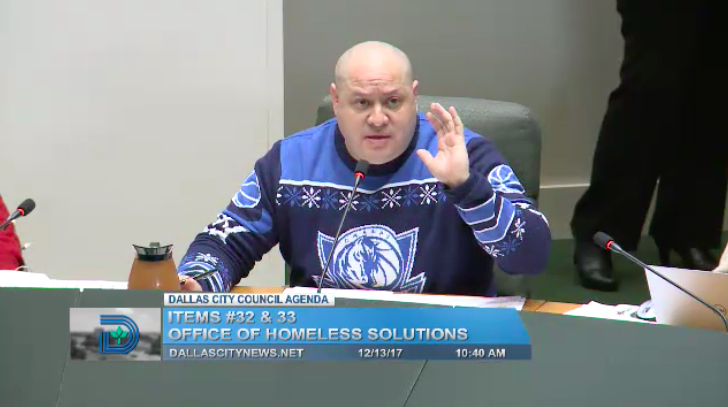 Dallas City Council Christmas Sweaters: Who Wore It Best? 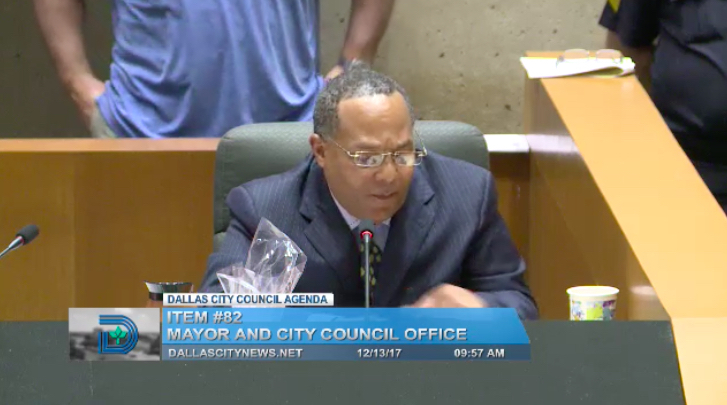 This is an important issue to the city. Not enough is being written about it. 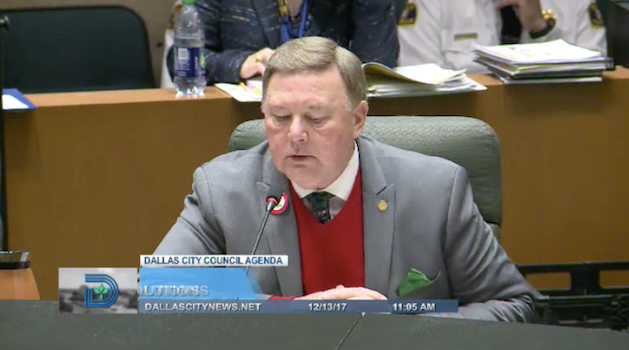 Today is the last City Council meeting before the Christmas break, so council members wore seasonal sweaters to show their holiday spirit. Well, some council members did. 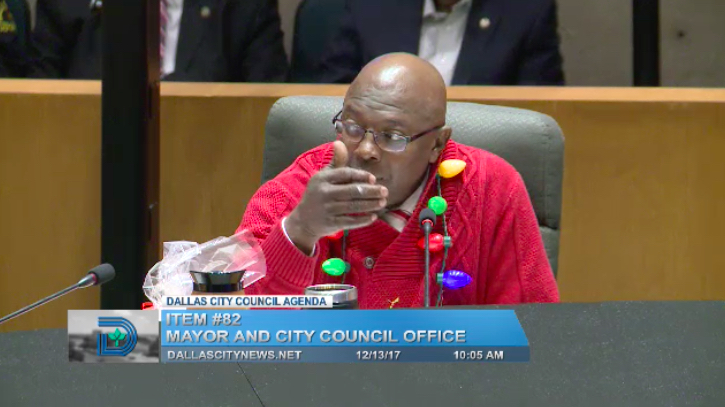 Other council members apparently hate toys and Santa and Jesus. Let’s take a look at who won this Yuletide sartorial tussle. Here we have Tennell Atkins. As you can see, his shawl collar sweater is red, a traditional Christmas color. That’s a good start. But those blinking lights are not part of the sweater! If this were a necklace contest, Atkins might have a shot. But this is not a necklace contest. It is a sweater contest. Now we are talking! Dwaine Caraway does it right. He’s got the blinking tiny Christmas lights wrapped around his arms, and he has ornaments pinned to the sweater proper. 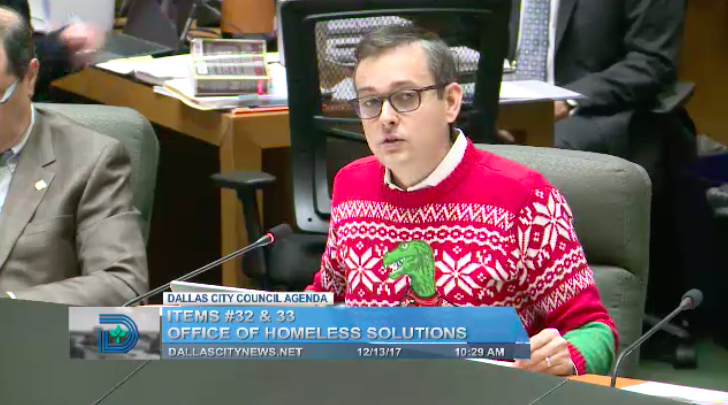 He gets points for making this himself — or for sending a staffer to Jo-Ann Fabric to buy the supplies and craft the crap out of this sweater. So trill. I’ve seen enough red sweaters at this point. And Mike Rawlings didn’t even bother with lights. This is not a Christmas sweater. It’s just a red sweater. I expect more from the mayor. 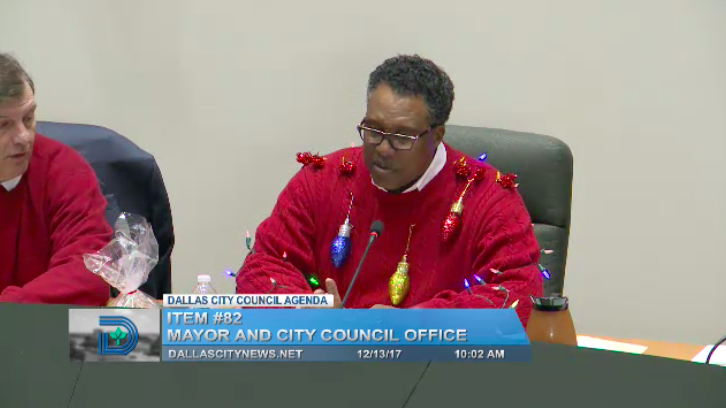 If you’re coming to work on Christmas sweater day, and if you know you have to sit next to Dwaine Caraway, then put some damn effort into it. This crap might fly in Bedford. Not in Dallas. Not now. Not ever. 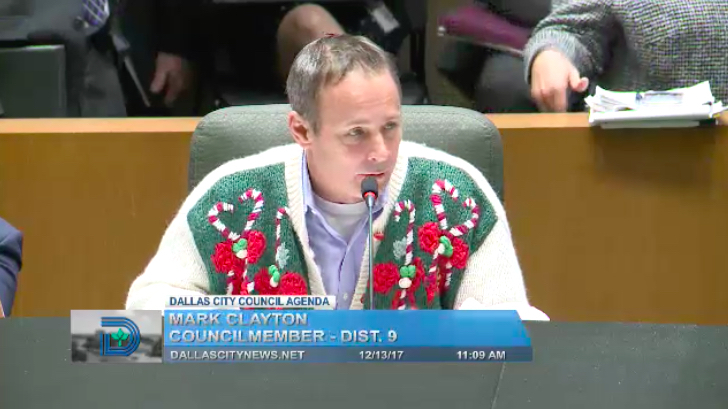 Just because you’re Jewish doesn’t give you a pass on Christmas sweater day. I’m serious about this. 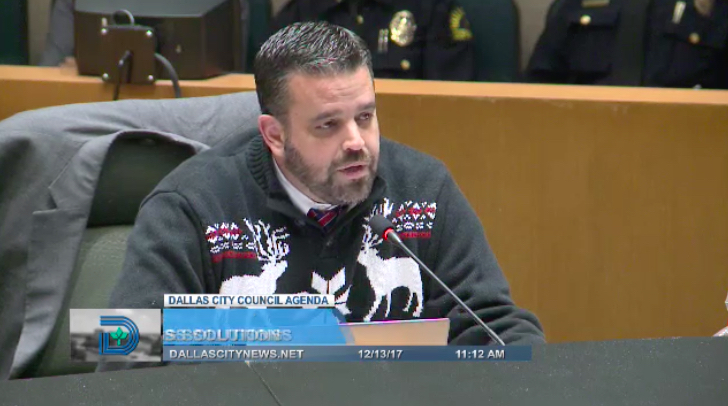 Lee Kleinman should have worn a sweater with a menorah on it. A dreidel. Something. I don’t think Casey Thomas is even Jewish. His last name might sound Jewish, but Kevin Felder, from the 30 seconds of internet research I did, is not Jewish. He’s just a Grinch. Adam McGough’s wife clearly put this outfit together, and she did a great job. She didn’t try too hard with the tie, and it works perfectly, matching the red accents above the reindeer. She said, “You can’t compete with Dwaine Caraway, so don’t try to. Just be you. Gray. Understated. Classic.” Yes! With the shot clock about to expire, Adam Medrano pulls up at the arc and nails a 3-pointer with this MFFL-themed white and blue beauty. If they gave a Larry O’Brien Trophy for sweaters, Medrano would rightfully hoist it above his head and sing “We Are the Champions.” Whereas McGough’s wife chose his sweater, Mark Clayton chose to wear his wife’s sweater. As a resident of District 9, I look at this sweater and ask: WWSJ? What would Sheffie do? The last time Rickey Callahan let his hair down and had some fun was 1987, when he gave himself permission to have a second Coors Light while watching an episode of Airwolf by himself because his wife was playing Bunco at the neighbor’s house. Yes, he’s got the jaunty green pocket square, but the gray blazer over the red V-neck with tie says, “I’d like to talk with you about your term-life insurance needs.” Sandy Greyson just took advantage of her office’s casual attire day. Adam Medrano, seated to her right, is hanging on the rim after he dunked on her. This ensemble is so Philip Kingston. Meaning: it is totally obnoxious. 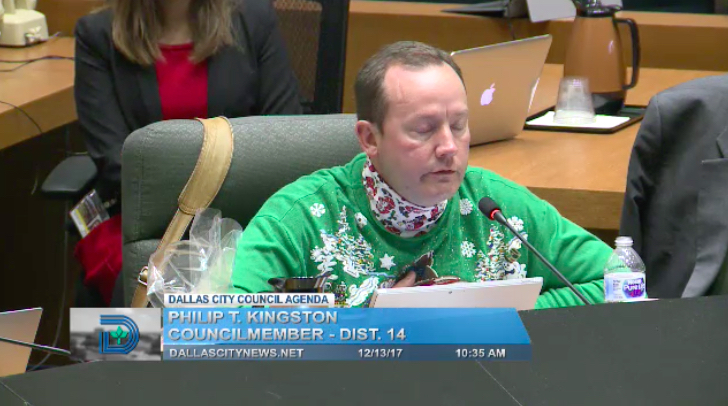 I don’t know what’s happening with that turtleneck, but the way it fights with the sweater reminds me of the way that Kingston and Caraway fight at the horseshoe. It’s all just for show. Ladies and gentleman, citizens of Dallas, we have a winner. Scott Griggs is wearing a Christmas sweater with a velociraptor on it. And that velociraptor is wearing a Christmas sweater (hard to see with the chyron but trust me). This sweater operates, like Griggs, on the next level. 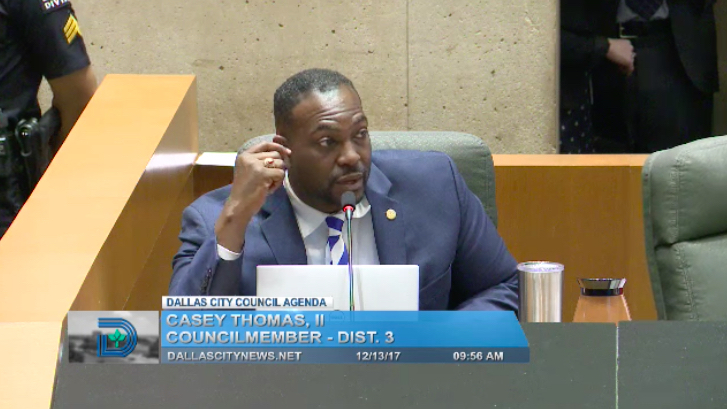 It’s just like when today, at the Council meeting, while discussing the city’s contract with the Bridge, Griggs started laying into the Metro Dallas Homeless Alliance and what a sorry operation it is. 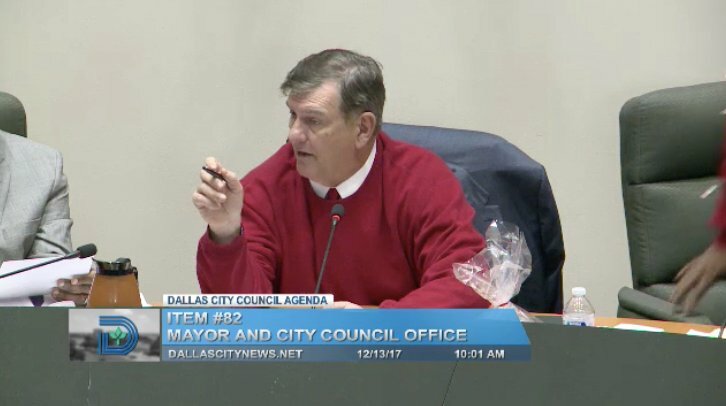 At which point the mayor, in his boring red sweater, interrupted to point out that they weren’t there to discuss MDHA. 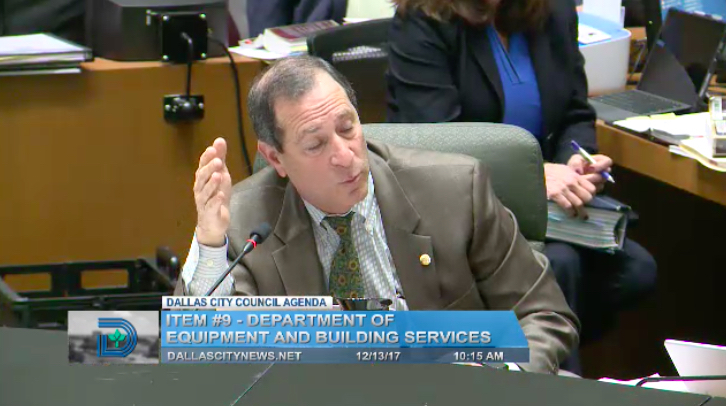 And so Griggs calmly pointed out that paragraph 48 of the city’s contract with the Bridge details how the Bridge works with MDHA, making his observations pertinent — and he just kept on trashing the operation. Good show, Councilman Griggs. Thank you for your service. 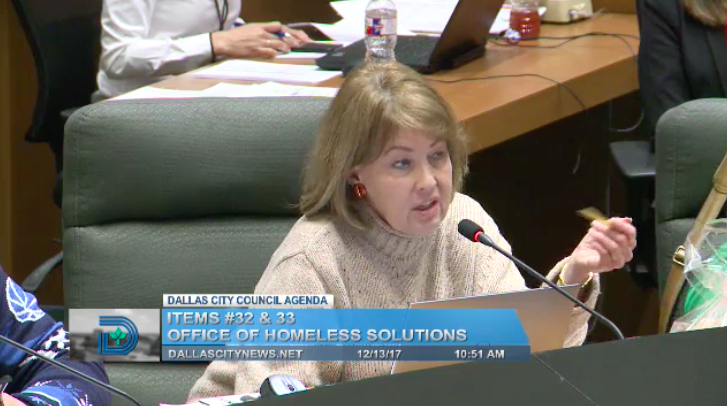 UPDATE: Jennifer Gates wore a Christmas sweater with a light-up necklace not unlike Atkins’. She was inadvertently left out of our assessment of Christmas sweaters. We regret the omission.